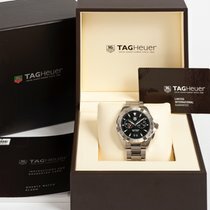 Swiss watch manufacturer TAG Heuer is the chronograph specialist. For over 150 years, they have been producing high-quality timepieces. The brand is synonymous with car racing and had its film debut in the 1971 classic Le Mans. TAG Heuer has always had a close connection with sports. This Swiss manufacturer is the time-stopping specialist: They developed their first stopwatch in 1882, produced carriage clocks, and now create the most modern chronograph wristwatches. This was a fact well known to actor Steve McQueen when he wore the square-shaped TAG Heuer Monaco in the 1971 film Le Mans. This watch, with its dark blue dial, achieved cult status thanks to its appearance in the film. Today, the manufacturer, based in the town of La Chaux-de-Fonds, is well-known for their precise chronographs and considered one of the top Swiss watch manufacturers. Race car driver legends such as Ayrton Senna and Bruce McLaren relied on the precision of their Carrera watches. Even US President Barack Obama wore a TAG Heuer watch during his time as senator. His watch from the 1500 series resembles the models in the Aquaracer series. TAG Heuer introduced the Monaco in 1969, two years before its cinematic premiere. The watch, with its distinctive square-shaped case, is powered by the caliber 11, one of the first automatic calibers in the world with a chronograph function. The manufacturer developed the movement in 1965 together with Breitling, Büren, and Dubois Dépraz, a manufacturer of movement complications. Heuer invested a hefty 500,000 Swiss francs in the development of this caliber, which needed to fit in a square-shaped, waterproof case. Jo Siffert, a Swiss Formula 1 driver for Porsche, was an ambassador for the watch, which was named after the principality located on the French Riviera. In addition to his Monaco, actor Steve McQueen donned a pair of overalls that originally belonged to Siffert in the film Le Mans. The film told the story of the rivalry between two race car drivers during the 24 Hours of Le Mans race. The watch profited from the film's success and is considered a coveted collector's piece today. The Carrera collection is one of this Swiss manufacturer's most well-known and successful series. Racing enthusiast Jack Heuer, great-grandson of company founder Edouard Heuer, was the official timekeeper at the 12 Hours of Sebring race in Florida in the 1960s. The stars of the 1962 race were brothers Ricardo and Pedro Rodriguez from Mexico, who raced for Ferrari. The Rodriguez family excitedly conversed with Jack Heuer in the pit about the legendary Mexican car race Carrera Panamericana. Racing was such a passion of Jack Heuer's that he named an entire collection of watches after the race: the chronographs in the Carrera series. Heuer introduced the Carrera series to the market in 1963. The manual caliber Valjoux 72 powered the first watches. Since 2010, the manufacturer has used a caliber produced in-house, the Calibre 1887, which is based on Seiko's caliber 6S78. The Carrera watches from the 1960s had a round case and a dial edge with a 45-degree angle and 1/5 second demarcations. The watch's design resulted in improved readability and a dial about 2 mm larger. Additionally, three subdials for the small seconds and 30-minute and 12-hour totalizers were set deeper, creating a three-dimensional look. The dial was easy to read and forwent tachymetric and telemeter scales. Its clean design and readability contributed significantly to the series' success. This simple watch coordinates just as well with business suits as it does racing suits. Today's collection contains chronographs as well as countless three-hand watches without a stopwatch function. Their design remains faithful to the spirit of the series and its long racing tradition. 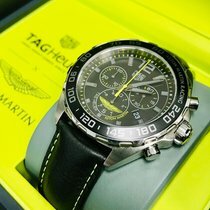 Watches from TAG Heuer perform just as well off the racetrack. 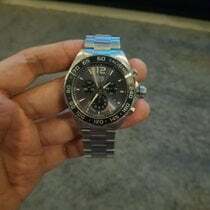 A good example is the Aquaracer series. The name already hints at the fact that this watch series is directed towards divers and lovers of water sports. TAG Heuer is no newcomer when it comes to water resistance: They were producing water-resistant pocket watches back in the late 19th century. Their automatic watches from the Aquaracer series are reminiscent of diving watches from Omega and Rolex. The series features classic three-hand models as well as varieties with a stopwatch function. Together with actor and environmental activist Leonardo DiCaprio, TAG Heuer introduced a special limited edition Aquaracer in 2009. A percentage of the sales earnings are donated to environmental protection organizations. The history of TAG Heuer began in 1860, when 20-year-old Edouard Heuer founded his then-tiny business in the Swiss town of Saint-Imier. Four years later, Heuer was so successful that he moved his company to an impressive building in Biel. In 1882, Heuer patented his first stopwatch and production began that same year. He developed the so-called oscillating pinion, a revolution in chronograph production, five years later. This mechanism is comprised of a movable stem and two pinions, with one pinion constantly engaged with the second wheel. In 1902, Charles and Jules Heuer took over the family business. Under their leadership, the company focused on producing specialty watches, such as the dashboard chronograph Time of Trip in 1911. The chronograph measured in at 11 cm in diameter and was perfectly suited for installation on car and airplane dashboards. The large central hand told the time while the small pair of hands at the 12 o'clock position timed periods up to 12 hours long. Heuer achieved another milestone in 1916 with the Mikrograph, a chronograph able to measure time up to 1/100th of a second. The delicate second hand only required three seconds to make a full revolution, and its balance wheel vibrated at an unbelievable frequency of 360,000 alternations per hour (A/h), or 50 Hz. Such a "super timer," as Heuer called it, is perfect for measuring the flight time of artillery projectiles. At the beginning of the 1930s, Heuer introduced the Time of Trip's successor, the Autavia. Its name is a combination of the words "automobile" and "aviation" and is well suited for use while racing and flying. The Autavia has a center second hand and two subdials for the 60-minute and 12-hour recorders. The stopwatch was often found together with its counterpart, the Hervue dashboard, on a solid base plate. The Hervue had a power reserve of eight days and a movement from Revue Thommen. In 1962, exactly 30 years after the Autavia premiered, Heuer presented a wristwatch chronograph with the same name. In January 1964, the family business Ed. Heuer & Co. S.A. merged with Leonidas Watch Factory Ltd. However, the Heuer family continued to run the show. Over the course of the quartz crisis, the production of mechanical watches was almost completely discontinued. This resulted in the company adding quartz watches such as the Chronosplit to their portfolio. In 1982, the then-head of the company, Jack Heuer, was forced to sell his shares in the company. The watch manufacturer Piaget then took charge from 1982 to 1985. In 1985, Techniques d'Avant Garde (TAG) entered the picture and took the reins. In 1988, the company was renamed TAG Heuer S.A., and in 1996, they went public. The French luxury concern LVMH (Moët Hennessy Louis Vuitton SE) has owned the company since 1999. With the Carrera Calibre 360, a wristwatch resembling the 1916 Mikrograph, TAG Heuer set a new record. This watch, produced in 2006, had two movements: one for the actual time display and one for the chronograph. The main movement was an ETA 2892 with an official chronograph certificate. The chronograph module with a flyback function and 30-minute counter vibrated, like the Mikrograph, at an astounding 360,000 A/h. Until 2012, this was a record for a mechanical wristwatch. Six years later, the company outdid itself with the Mikrotimer Flying 1000 prototype. The watch is able to measure time to 1/1,000th of a second. In comparison, the Carrera Calibre 360 can "only" measure to 1/100th of a second. The Mikrotimer's automatic caliber has two separate kinematic chains, each with an escapement and oscillation system. The balance wheel of the regular time display vibrates at an average speed of 28,800 A/h (4 Hz). The chronograph system, on the other hand, vibrates at an unbelievable 500 Hz, or 3,600,000 A/h. Only the TAG Heuer's Carrera Mikrogirder can measure time more exactly: It can measure time to a 5/10,000th of a second. TAG Heuer: "Don't Crack Under Pressure"
TAG Heuer is a manufacturer with one of the closest ties to car racing. The history of this Swiss company reads more like an encyclopedia of the sport. Today, TAG Heuer remains a sponsor and official timekeeper of sports events. With their forward-thinking technology, the manufacturer is turning traditional watchmaking upside down, pushing boundaries, and always chasing after new records. The brand is synonymous with precision, high-quality, and an adventurous spirit, and the watches stay true to their motto: They "don't crack under pressure."